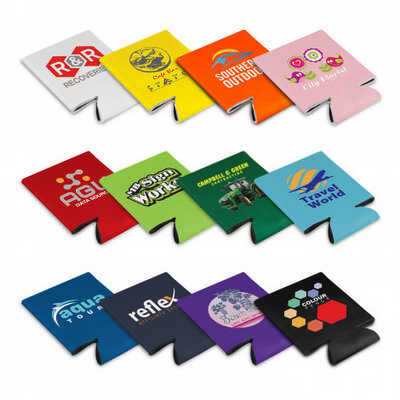 Can and stubby holder that is manufactured from laminated open cell foam material which offers excellent insulation. It prevents cold, wet hands as well as keeping drinks cool for longer. Kantastic will fit most cans and stubby bottles and is supplied folded flat for easy distribution and storage. Colours: White, Yellow, Orange, Pink, Red, Bright Green, Dark Green, Light Blue, Royal Blue, Navy, Purple, Black. Dimension: W 100mm x H 132mm x 8mm (flat). Print Description: 70mm x 70mm. Print Type: Screen Print. Packing: Loose packed. Price includes : 1 Col 1 Pos Print. Setup is included.